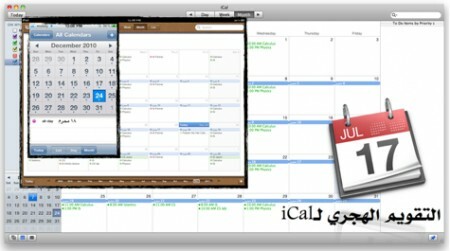 Even though Mac OS X supports Hijri calendar that option is missing from iOS. Work arounds include using a dedicated Hijri calendar app or add daily events to the regular calendar. Badr has once again created iCal files to add the 1434 Hijri Calendar. To install simply follow this link then click view. After that click â€œOpen in Calendarâ€. Or read our how-to. Download links: English download iCal file. Arabic download iCal file.